This section is adapted from the Anxiety and Depression Association of America website. Everyone experiences stress and anxiety at one time or another. The difference between them is that stress is a response to a threat in a situation. Anxiety is a reaction to the stress. 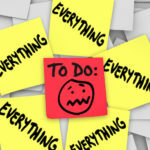 Whether in good times or bad, most people say that stress interferes at least moderately with their lives. Chronic stress can affect your health, causing symptoms from headaches, high blood pressure, and chest pain to heart palpitations, skin rashes, and loss of sleep. But you can learn how to reduce the impact of stress and manage your symptoms. Physical activity is a proven way to reduce stress. Regular participation in aerobic exercise has been shown to decrease overall levels of tension, elevate and stabilize mood, and improve sleep and self-esteem. Other effective methods include breathing exercises, yoga, and meditation. Relaxation techniques have been used to assist in the treatment of phobias, panic disorder, and depression, as well as providing relief for people in stressful situations.